Parakeets, also known as budgies, are highly intelligent little birds who are popular as pets for the simple fact that, among the many pet bird varieties, they are some of the more inexpensive to purchase. These birds love attention and crave human interaction. They also love to chew on things, and paper is no exception. A parakeet is intelligent; he needs something to do with his time. If he gets bored, he might drop down to the bottom of the cage and chew on the paper liner. Much of the time this is how paper-chewing begins. You can provide many types of paper. The habit is harmless but messy, and it gives the bird something to do during the times when he has little interaction with his owner. Parakeets might mouth paper just to alleviate boredom, but it can occur on a more positive note. Parakeets love toys; most owners provide theirs with a few colorful toys and mirrors to keep them occupied. Sometimes, shredding paper is a parakeet's idea of a grand game. Your part in the fun as pet owner, if you don't mind the mess, is to keep providing paper. Most types of paper are reasonably safe; birds seldom swallow it. Chewing is natural for parakeets to do. They have continuously growing beaks. If it appears that the bird is chewing everything, including paper, the reason could be a fast-growing beak. In this naturally occurring condition, the beak might grow too long, leaving the bird unable to eat properly. Providing the parakeet with a nontoxic, wooden toy or cuttlebone designed for chewing could prevent the issue; if it's too late, schedule an appointment with the vet to grind down the beak. Female parakeets who are ready to lay eggs will do so whether they breed or not and will shred whatever is handy in order to make a nest. She will drop the first egg on the cage floor nothing is available to shred. Since parakeets seldom swallow paper they have shredded, she will not suffer from ink toxicity, though plain paper is great just to be safe. BirdChannel.com: Paper --Is It Safe For My Bird? 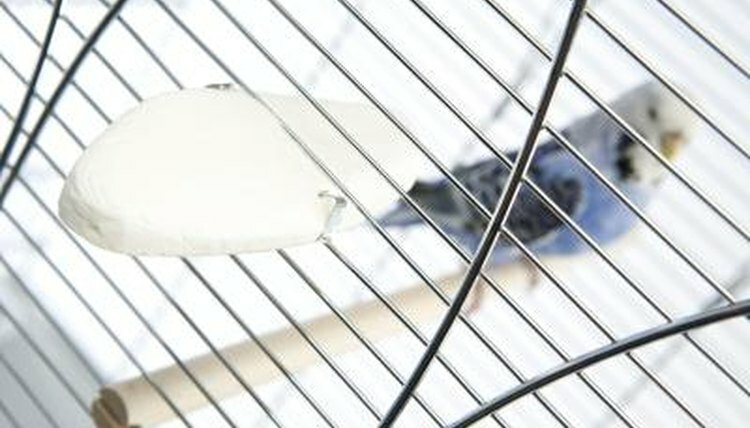 What Causes Trembling in Budgies?